Jim Aiken studied at Maynooth for four years to be a priest. He was once described as "the old Padre." Everyone from Bob Dylan (who played Slane Castle in 1984 for Big Jim) to Bruce Springsteen (Slane, 1985) to Roy Orbison (who at the height of the Troubles in Northern Ireland wanted Jim and his family to move to Nashville so Jim could manage him) loved The Padre. In summer 1978 his teenage son Peter was at boarding school in Armagh with less than priestly thoughts on his young mind. "I remember we were all playing the Some Girls album by the Rolling Stones in boarding school," Peter remembers, 40 years later. "We heard this line from the song Miss You - a teacher used to play for us in school for the boys going to matches and stuff - 'there's some Puerto Rican girls that are just dying to meet you'. We were just thinking, 'We'd love to meet someone from the convent. But from Puerto Rico! Puerto Rican girls! It just sounded like the most mysterious thing ever!" Peter roars with laughter. "If someone said to me in 1978, 'Do you want to go to Queens in Belfast', I'd say, 'No, I want to go to New York to meet Puerto Rican girls!'" Four years later he was standing in a field in front of Slane Castle one evening when a familiar-looking man drove up to the gates in a green BMW. "Jagger got out of the car. It was the night before the Stones show. It was totally sold out and Jagger wanted to give out tickets to fans who were standing outside the main gate. "So the oul' fella," Peter says, referring to his dad, the late great Jim Aiken, who was promoting the show, "passed me a big stack of tickets. I ran up the hill and handed them to Jagger. "He asked me what I was doing. I told him I was helping to paint the stage. He looked at my hands, which were covered in purple paint, and said: 'What happened to your hands? Painting the stage? You've got more paint on your hands than the stage!' He then handed the tickets out to the locals. It was incredible to see that, this living legend." Even more incredible for the Padre's son Peter and the thousands of fans was the performance the following night at Slane Castle. "I remember the first song The Stones played at Slane was Start Me Up. I was 18. 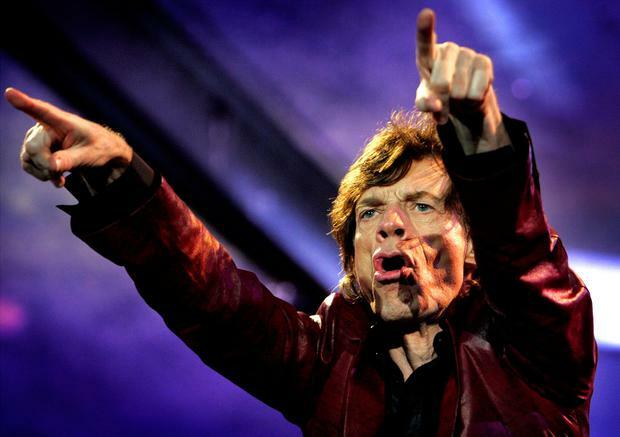 It blew my mind," says Peter who is putting on the Stones at Croke Park on May 17. "I am first and foremost a concert-promoter and a businessman but, most importantly, I am a music fan. "One of the greatest shows I ever saw was Bruce Springsteen at Slane Castle on June 1, 1985," Peter says of another famous concert put on by his oul' fella. "I remember hearing Darkness on the Edge of Town for the first time in the summer of 1978 in Belfast. I was only a kid. I went out and bought the album - it changed my life. "It was more than music. It had a power and a magic that Bruce still has today," says Peter who, as a teenager, worked as a roadie with Rory Gallagher on tour across England. "Ah, fantastic times. I bought 200 Rothmans on the ferry over on that tour. I don't know anything else you could do at 17 that's better than that," he recalls. "Rory was able to do four nights at the Ulster Hall in Belfast and two nights at the National Stadium in Dublin in the mid 1970s with one outlet to sell tickets. If Rory was around now, he could do eight nights at the 3Arena, I have no doubt about that. He was a genius." Peter believes the same of Ed Sheeran, who is starting a sold-out tour of Ireland this Friday. "Ed Sheeran is a great artist. He has sold over 400,000 tickets for his phenomenal Irish tour," Peter says. "That is absolutely incredible, if hardly surprising, because Ed is that good." Peter's father Jim - who died on February 27, 2007, at the age of 74 after a short illness - was also that good, and better, as a groundbreaking concert promoter on this island. The Padre put on the likes of Pink Floyd at the Ulster Hall in Belfast in 1967, the original Fleetwood Mac at the National Stadium in Dublin 1969, Led Zeppelin in the Ulster Hall and National Stadium in 1971, to name but a few. What did Peter learn from his father? "To be respectful to your wife and kids. It's as simple as that. My father was a great man." And what did Peter learn from the stress of his five sold-out Garth Brooks concerts in July 2014 at Croke Park which were controversially cancelled with more than 400,000 tickets sold? "What I learned is that my wife and kids are all that matter," Peter says, referring to the beautiful Mary Aiken, an author and cyberpsychologist, and their children. "They will always be there for you - and I for them." The Padre would be proud.